While a majority of Americans (55%) favor the death penalty for persons convicted of murder, according to a 2013 Pew Research survey, that number has declined significantly over the last two decades. In 1996, about three-quarters of the U.S. public (78%) favored capital punishment. Meanwhile, the share of those saying they oppose the death penalty has risen from 18% in 1996 to 37% in 2013. Our survey questions about the death penalty sometimes give respondents the opportunity to specify whether they “strongly favor” or “strongly oppose” the practice. 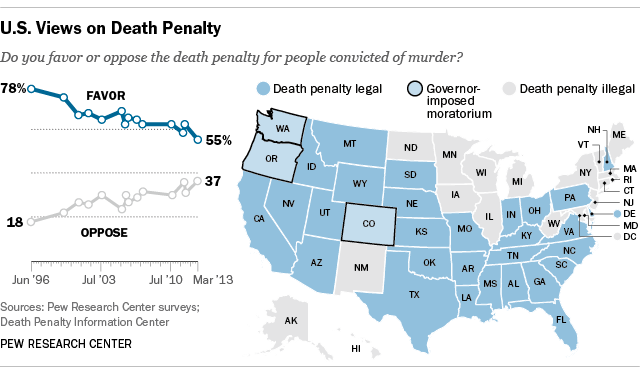 In 2013, 18% of Americans said they “strongly favor” the death penalty – a steep drop from 28% who said this in 2011. Against this backdrop of public opinion, several states have legally banned the practice in recent years, bringing the total to 18 (plus the District of Columbia). That leaves 32 states where the death penalty is legal. A number of states, including California, North Carolina, Arkansas, Kentucky and Georgia, have de facto moratoriums on the death penalty while state courts weigh lawsuits dealing primarily with execution methods, according to Richard C. Dieter, executive director of the Death Penalty Information Center, a non-profit organization in Washington that collects information on the death penalty. In Washington state, Inslee explained his decision by saying that there have been “too many doubts raised” about the death penalty, and there are “too many flaws in the system today,” according to the Associated Press. In 2011, we asked Americans why they oppose or support the death penalty, and 27% of those opposed to the death penalty cited the imperfect nature of the justice system as their reason. That was one of the two most common answers; 27% also said the death penalty is wrong/immoral/not our right.